Quite a few vehicles up here in the Boston Mountains have what we call “deer dings.” My wife Maggie hit a deer coming home one night a few years back. Presto! 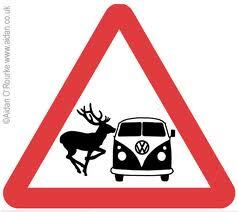 Deer ding! You can buy “deer sirens” at the auto store, but trust me, they do not work that well. Good eyesight and quick reflexes are the only preventive measures that work well. Just before I reached our country road today, about twilight, a magnificent buck leaped across the highway in front of me. It is not his fault that we humans build roads and drive vehicles on them. THEY were here before WE were here. Anyhow I was lucky this time. This entry was posted in Animal, Flora and Fauna, Necessities, Tools and tagged Boston Mountains, Deer. Bookmark the permalink. Or worse . . . you could ding the deer! Got my first deer ding last fall. Not much ding to the truck, but a fatal mishap for the yearling doe, I saw the first 2 cross and thought the parade was over. Many near misses in almost 50 years of driving. Guess it was just time.